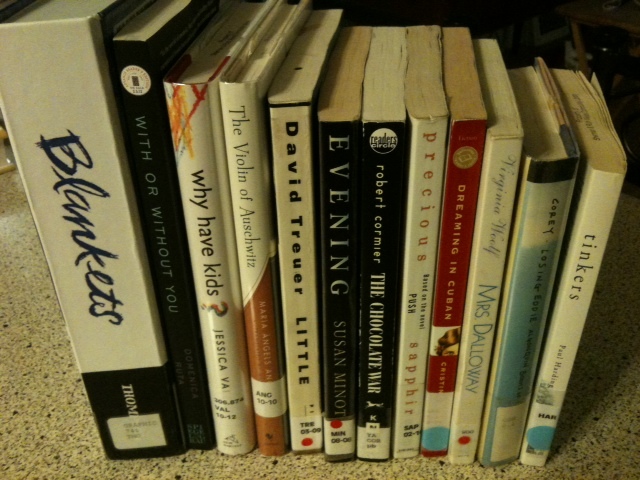 The Relentless Reader: Readathon Preparation! Who else is getting ready for the READATHON? I'm going to capitalize that word because I'm so excited! EXCITED!! Today I hit the library and the grocery store. Books and snacks. Yay! I browsed until I had found a nice stack of smallish books. I think I'll have plenty to read, even if I end up not liking one (or more) of them. That thick sucker on the left? That is Blankets, a graphic novel by Craig Thompson. I thought that would help to break things up for me if my head starts hurting from all of the words. The snacks. Salty and sweet, just like me. Don't fret, I'll be picking up some fruit and veggies too. And bagels, don't forget the bagels and cream cheese. Perhaps apples dipped in peanut butter? I'm a bit too excited about the food I think. I love, love, love your sense of adventure! If I tried to tell myself to stay up and read for 24 hours, my little old lady self would panic and I would fall asleep at like 6:30 or 7:00. Ask my boys about my failed attempts to stay up on New Year's Eve. Readathon is this weekend??? GAH! I am going to miss it - craft weekend at the cabin. I love the readathon! Have fun your snacks look perfect! I got my booklist together today. Great list you have! The only one I've read is Push by Sapphire. Intense. I had issues keeping my reads short, only two of them are under 200 pages. Woops! I will be picking up snacks and iced coffee tomorrow. That should be a fun shopping trip :) Love that your snacks are right in front of your bookpile. Books, coffee, snacks. Omg it's going to be the PERFECT day! I REALLY want to make at least twelve hours. I started by saying four. Then eight. Now twelve. HA! I guess we'll see how long this little girl makes it, shall we? I'll definitely have to drop on by for an update and to cheer you on a bit :) I checked the page numbers when I did by booklist post yesterday ;) I'm weird like that. What a great-looking stack! Sapphire is such a powerful read. Blankets is a really nice "soft" read and Little is on my tbr list. I hope you enjoy your reads. I have heard great things about Blankets, so I hope you enjoy it! That Quaker popped snack thing looks good! My pile is filled with fluff, so I greatly admire yours! Wow this is awesome!!! I can read for a long time at a stretch, but I am not sure I could make 24 hours, I would probably pass out. I am cheering you on! Thanks Allison :) I'm a little devastated to realize that I bought dark chocolate raisinets. Rats. I'll have to return those and get the GOOD kind darn it! I'm super excited about Blankets. It's my first graphic novel! I don't think you can ever get too excited about food ;) Ha! Great idea, to prep an illustrated book to relax your tired eyes :) Happy readathon! It's almost Saturday! You're well prepared! That stack of books looks good - nice and shortish so you won't get stuck in one book for half the read-a-thon. I have my stack ready. Now the food! I just remembered that I have a copy of Anna Quindlen's How Reading Changed my Life. It's very short and one of my faves. I think I'll start my day out with that. Your book stack looks great. I read Tinkers a year or two ago - it had some truly beautiful writing. I've read it before but I don't remember much beyond that it was tough going for me. I've heard if you read her stuff aloud the stream of consciousness is a bit easier to get through. Maybe I'll try that! :) Thanks for stopping in Vicky! Blankets is a fantastic read, perfect for a readathon! Thanks April, I'm excited to read it :) I've heard great things about it for one, and it will be nice for my eyes to see some pictures instead of all words, words, words! Good luck with the readathon! I hope you enjoy Blankets. I've been dying to read it, but my library system doesn't have a copy and it is so expensive to buy. And dark chocolate covered raisins? Mmmm...I think we can be friends. You have a great pile there and yummy snacks! Jealous! I haven't got my snacks yet. I'm going to be out for part of the day tomorrow so maybe I can get some then. Good luck with the reading! I hadn't realised Blankets was so long! Good choice of snacks (providing you keep your word on the fruit :p), have fun! 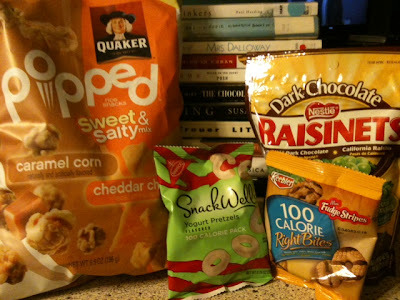 I don't need an excuse to read OR pig out on junk food, but the ReadAThon is a good one anyway! Rah, rah, ree! Kick 'em in the knee ... and keep reading! Have a blast today! Go Team Smarties!! Man, I missed the read athon!! Good luck...can't wait to see what you all read!!! I have plans to go tothe St Paul library tomorrow to see Brian Freeman speak. I decided I am going to try to go see one author a week. The perks of living in the cities! Terrible that I have never done this before.